I'm a proponent of "Breast is Best", but know that some people do need to use formula. In that case, organic is always a good choice. 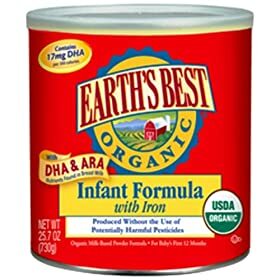 Right now Amazon.com has Earth's Best Organic Infant Formula with Iron (25.75-Ounce Canister) on sale 38% off. Regular price is $45.04, but now it's only $27.79. From the manufacturer: "Breast milk is the first choice for your infant’s growth and development, but if and when you choose formula, you should feel good knowing there is formula from Earth’s Best, the leading organic baby food. New Earth’s Best Organic Infant Formulas with DHA & ARA, available in dairy and soy, are specially blended without the use of growth hormones, steroids, antibiotics, dangerous pesticides or chemical fertilizers. They are nutritionally complete to provide 100% of the essential nutrients doctors recommend for babies during the first 12 months of life."